If I threw out a few mind your own business quotes today would you think I was being a smart aleck and be insulted? Can such a harsh statement possibly be motivational? This depends on whether or not you are willing to realize the benefits of minding your own affairs. If you are you will see that there is indeed an inspirational message in these words even though they are often delivered in a somewhat less than motivational manner. You might be wondering how somebody telling you to mind your own business could be anything OTHER than insulting. Certainly, the circumstances and delivery of the message is the key. For instance, I’m not about to try and convince you that when your teenage son or daughter catches you listening in on their private telephone conversations and gives you a piece of his or her mind that you should be inspired. However, when a caring friend after seeing you in an emotional state because of something that someone did that was completely out of your control tosses out some “mind your own business” quotes, how could you fail to see the benefits? Trying to control another person’s actions, no matter how well meaning your intentions may be, is an exercise in futility that is only going to leave you at best frustrated and defeated and at worst a candidate for depression. Minding your own business is the best way to lift the weight of taking personal responsibility for another’s actions off your shoulders. It takes practice, but once you experience the freedom that comes from being responsible for your own life alone I have doubts that you will want to return to a codependent existence. One of my favorite mind your own business quotes is "Clean your own backyard" which basically reminds us that we are only meant to control our own lives. It is a good idea to listen to our loved ones when they have problems and offer advice carefully when asked. I’m sure that you will find that if you truly tend to your own business you will have very little time to meddle in the affairs and privacy of others and see just how liberating that will be. Quotes about change are important and would you like to know my opinion on why this is so? If you are still logged in and reading beyond the question mark punctuating the opening line to this paragraph I must assume that you are indeed slightly curious. Perhaps you are even interested to the point of intrigue as to what my thoughts might be on the underlying importance of powerful quotes about social changes. I won’t keep you hanging and in suspense any longer; the reason that quotes about change are so uplifting and significant is because they give us hope for the future. Was that a huge letdown or did you already guess what I was going to say? If so, you already have felt the lift in your mood when an important political leader or spiritual leader preached on the need for change in our less than perfect behavior and the ways of the world. So, when will we see this dramatic turnaround that is going to benefit all of mankind? The answer to that question is right in front of our faces. It does not start with President Obama’s inspirational quotes about change and it didn’t start with your minister’s sermon last Sunday morning. Change begins within the heart of each individual. If you find the President’s speeches about change or your preacher’s more Biblical approach to the subject motivational the world as a whole will reap the rewards. Each and every individual who experiences an awakening of the spirit and makes the decision to approach his fellow man in a more positive and loving way brings us nearer to a better existence as a whole. I wish there Johann Von Goethe quotes and posters from seemed to be a very young visitor. I couldn't help but wonder which of the many quotations that are credited to this polymath from long ago had proven to be inspiring to this young person and began to sort through the many profound sayings that have been recorded for posterity and I must say that most were short and to the point while being loaded with good, common sense. Others were more flowery, but nonetheless still firmly based in the tenets of wisdom while offering practical advice for living one's life to the fullest. In fact, many of Johann Von Goethe's quotes carried advice for getting the most out of life and following your dreams. What I can appreciate is that he didn't sugarcoat what it might take to bring one's dreams and ambitions to fruition. Rather, in perhaps his best known Motivational Inspirational Posters Poems and Quotes that is often titled "How to Live Your Dreams" he states that dedication and commitment are key to avoid the risk of killing excellent plans and ideas. To put it in plain language, don't dilly dally around with your dreams, be bold, dedicated and above all; get started before it is too late to carry them out. Here is the Johann von Goethe quote in its entirety that states "Until one is committed, there is hesitancy, the chance to draw back, always ineffectiveness. Concerning all acts of initiative and creation, there is one elementary truth the ignorance of which kills countless ideas and splendid plans: that the moment one definitely commits oneself, then providence moves too. All sorts of things occur to help one that would never otherwise have occurred. A whole stream of events issues from the decision, raising in one's favor all manner of unforeseen incidents, meetings and material assistance which no man could have dreamed would have come his way. Whatever you can do or dream you can, begin it. Boldness has genius, power and magic in it. Begin it now" and if it motivates you to have it printed on a poster, t-shirt or simply hand written on a piece of paper taped to your refrigerator by all means do so. You might also search in some of the excellent online stores maintained by individuals for inspirational Johann Von Goethe quotes on posters or printed on items that you can use to decorate your home. At times it makes us feel a little better to know that we are not the only ones who are dealing with the problem of addiction, thus the success of both AA and Al-Anon, so I dredged up some very interesting and inspirational drug addiction poems that were written long before the methamphetamine addiction epidemic or the problem of prescription drug abuse. I found an excellent and highly sought after book that offers some drug addiction poems that were written more than a few years ago. In fact, the two hundred poems contained in the book were written across a span of seven centuries reflecting a virtual smorgasbord of mental states many of which are common to both addicts and the people who are connected to them. Some people argue that addiction and mental illness are one and the same. It’s true that both serve up symptoms of despondency, despair and melancholia as well as manic episodes or as some believe, existence in a state of heightened perception of the world and life as we know it. Whether or not you find this book of poems of drug addiction and quotes inspiring depends on where you are in your recovery as well as your mindset at the time of reading and whether you are prone to depression. I did find the book depressing but a marvel of creativity with the likes of Sylvia Plath, George Herbert, John Clare, Samuel Taylor Coleridge, John Berryman, Ann Sexton, Weldon Kees, Lucille Clifton, Jane Kenyon and other poets worthy of not. 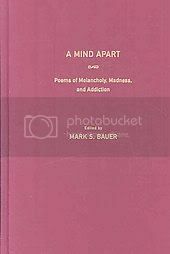 This book, A Mind Apart by Bauer, is most appreciated by those who are suffering from addiction, mental illness or those who simply appreciate poetry written by those who have experienced the heights and depths of the human spirit. I was reading some poems about old houses recently and found them to be very thought provoking. I am not such a huge fan of architecture that the sight of an old building makes me want to take up pen and paper and compose inspiring poems voicing my admiration for attractive piles of wood, bricks and stone that were constructed long ago. But when I recently visited the site of the old family homestead where I had spent so many wonderful holidays and summers in my early years the longing to see those much loved faces that are now gone was enough to make me ache and take a few minutes to write about how being there alone made me feel. I dropped by the old home place. Where I spent summers for years. But there in the quiet empty rooms. I failed to control the tears. I looked forward to returning for a visit. Thinking it would be like before. There would be family waiting at the door. Of happy times in their home. Even after I returned home the memories of small details like how warm a really fresh egg can be, how sweet a baby calf’s face is and best of all the joy of being in the presence of my grandparents. Where classic architecture failed to inspire me to write, the sight of an empty, old farm house where I had once enjoyed being surround with affection makes me rethink the inspirational qualities of poems about old houses. Do you have a poem about old houses that you would like for me to post on Motivational Inspirational Posters Poems and Quotes? If so, please use the comment form to submit your poetry about old houses that inspired you and I'll be happy to post it with credit.